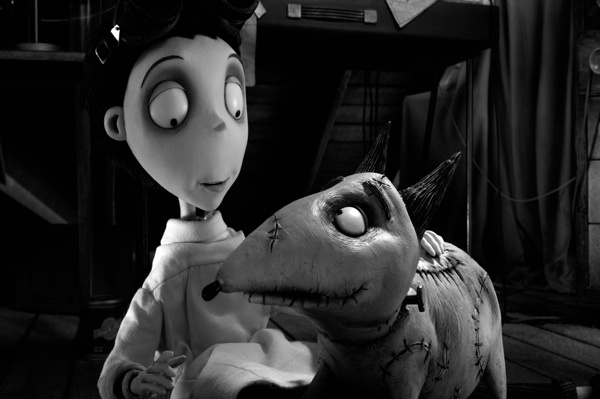 Death takes a holiday in Tim Burton’s latest film, Frankenweenie. Disney has released a new trailer for the 3D animation that pays homage to a horror icon. The story’s sweet, entertaining and scary fun for all ages. He has risen! Frankenweenie is back from the grave and starring in a new animated feature. The film is directed by Tim Burton and inspired by Mary Shelley’s classic horror story, Frankenstein. It’s the same dark tale, but with a family-friendly twist. Unfortunately, Sparky’s livelier than ever and Victor has trouble keeping him a secret. Soon, the entire town is affected by the strange, yet lovable creature. Will Victor be able to control him, or will Sparky become more trouble than he’s worth? You’ll have to watch the movie to find out! Tim Burton originally produced Frankenweenie (in 1984) as a live-action short that starred Shelley Duvall, Daniel Stern, Barret Oliver and a young Sofia Coppola. But for the 2012 remake, he hired an all-new cast filled with familiar faces — or should we say voices? Frankenweenie stars Winona Ryder, who appeared in Burton’s Edward Scissorhands, Catherine O’Hara who starred in Beetlejuice, Martin Short from Mars Attacks!, Oscar-winner Martin Landau of Ed Wood fame and newcomer Charlie Tahan from Charlie St. Cloud. Frankenweenie opens Oct. 5 in 2D, 3D and IMAX 3D. Just in time for Halloween! What do you think of the new Frankenweenie? Does Burton have another hit on his hands?